← Studio City, California. May 11th, 2011. Jersey City, New Jersey. May 12th, 2011. A large sinkhole in Jersey City’s Greenville Section has resulted in electric, gas and water service to be suspended for a number of residence, and a roughly six-block area has been closed to traffic, officials said. The sinkhole, which is about 30 feet by 30 feet wide and about 5 feet deep, began collapsing at about 4 a.m. at Garfield and Linden avenues, Police Lt. Edgar Martinez said. Sinkholes have occurred repeatedly in the area and in February a Jersey City Fire Truck was trapped in a sinkhole there. United Water is on the scene, as is the Jersey City Municipal Utility Authority and Jersey City Office of Emergency Management, Martinez said. Heavy earth movers are working to stop the continuing collapse in the sinkhole and workers are making repairs to restore utilities. UPDATE: Jersey City Fire Director Armando Roman said the sinkhole was caused by a collapsed sewer line. 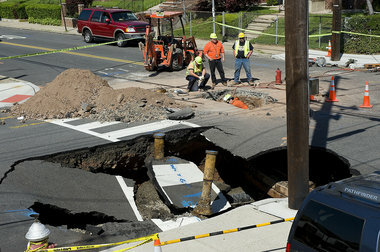 This entry was posted in Pictures and tagged huge sinkhole, Jersey City, New Jersey, sinkhole. Bookmark the permalink.